48 hours. 3 meals. We went to my grandma’s house for dinner on the 15th day of Chinese New Year so these are the selected places we ate at last weekend in Sibu when my dear came over. 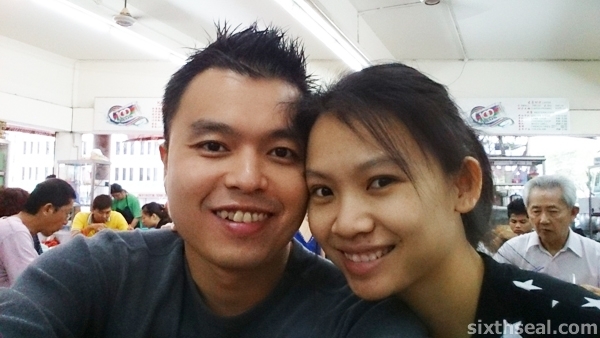 My better half had wanted to eat Sarawak Laksa for ages so this was the first place we went to. It was early in the morning, I had just dropped off my dad at the airport and we were heading back to town for breakfast when my dad commented that Aloha Cafe has the best Sarawak Laksa in town. Everyone has a favorite place but I personally don’t like the dish that much. 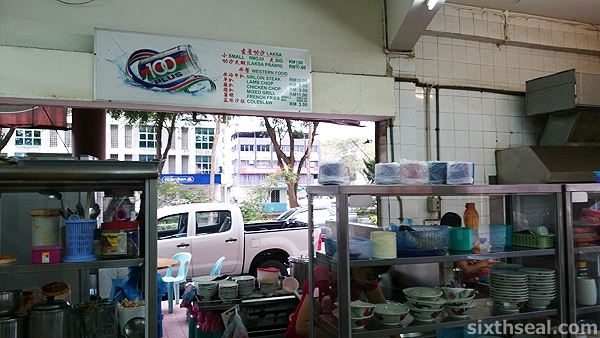 However, I haven’t eaten it for years so I ordered a Sarawak Laksa Supreme (RM 10). 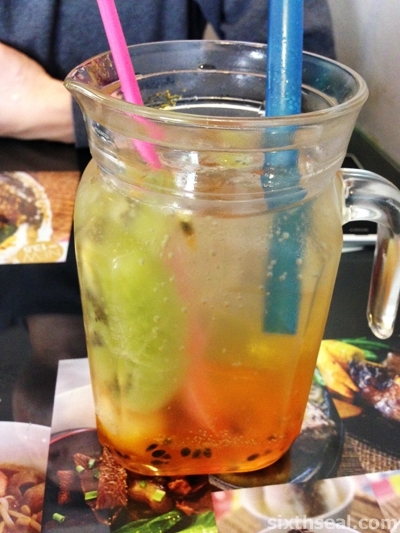 My dear wanted to go for the regular one (RM 5) but I convinced her to have the special (RM 7). The difference in prices is from the prawns, not the amount of noodles. 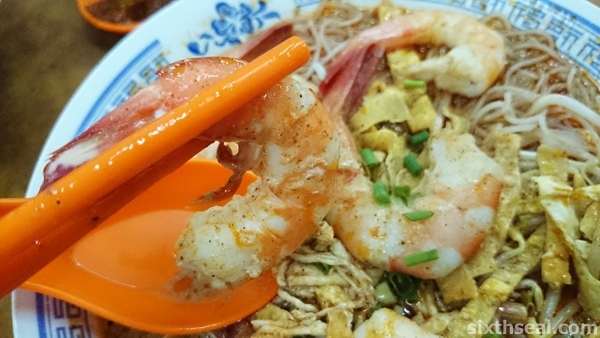 The RM 10 dish has the largest prawns while the RM 5 has tiny shrimp meant for regular cooking. 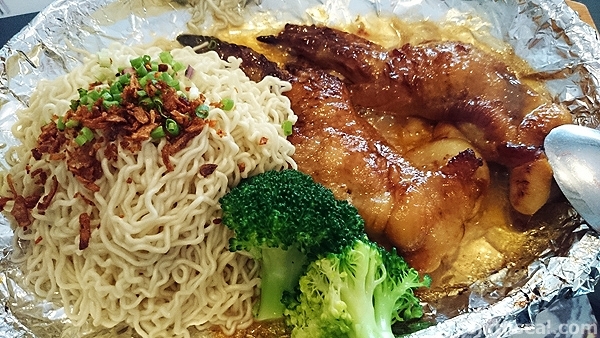 The RM 7 option lies somewhere in between – the prawns are large, but nowhere near the jumbo shrimp of the RM 10 dish. Just look at the size of the monsters! Aloha Cafe is right behind my alma mater so I used to eat here when I was in high school. 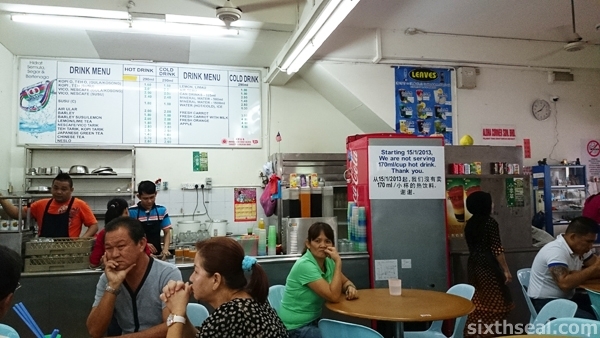 There’s a rather interesting signage that says that they won’t be serving 170 ml cup-and-saucer drinks anymore. These are the old school glass receptacles that hot drinks used to be served in, my late granddad loves pouring the coffee into the saucer to cool it down before sipping it. The regular glasses was considered “large” back then. I thought it was a rather interesting passing-of-an-age. Back in the early 90’s, there was one “cool” restaurant in town to hang out at. It was called Country Cafe and all of us high school kids went there during weekends. The place serves all sorts of food, including some wonderful fusion dishes that other places in Sibu didn’t have back then. One of the guys that I hung out with was called Peter, a classmate of mine who dreamt of opening his own cafe. 15 years later, he opened Cafe Cafe and it was a resounding success and led to many other restaurants and last I heard, he was starting a new one in Kuching. My dear hasn’t been here before so I brought her here for our (belated) Valentine’s Day dinner. 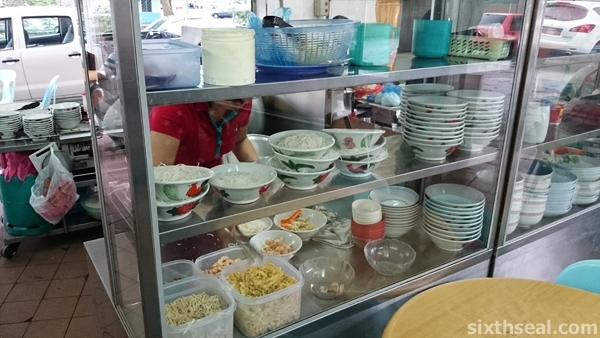 The Mee Mamak (RM 11) is a localized version of the nationwide favorite, with lots of tomato and chilli sauce. It’s probably the dish that gets ordered the most coz the portion is HUGE and it’s relatively cheap. I had fond memories of this and I ordered one to share with my dear and it’s still as good as I remembered it, although a more refined palate tells me it’s really not that great, nostalgia wins out for this one. 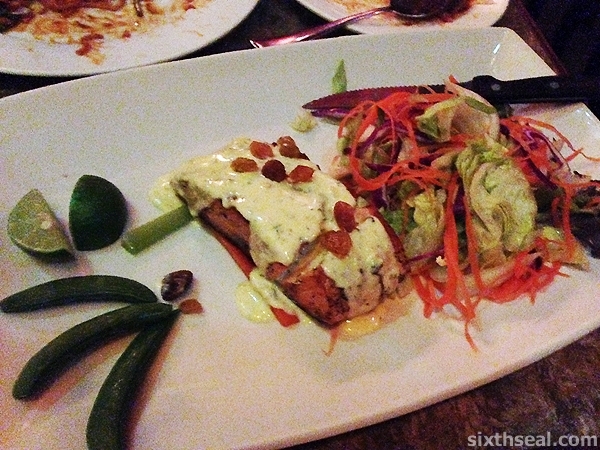 My dear went for the Norwegian Salmon with Lemon Butter Sauce (RM 28). We were rather interested in seeing if they took the time to pluck out all the bones from the fish and it turns out that they did! The sauce was good but it’s ultimately frozen salmon and you can taste that in the plated dish, which isn’t generally a good sign. I went for the Breaded Chicken with Spicy Prawn Sauce (RM 19). 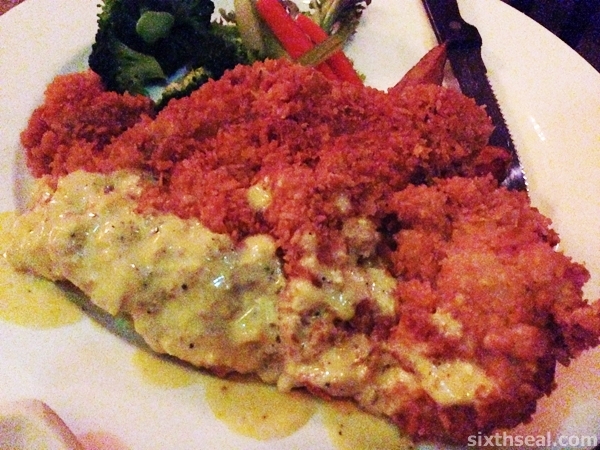 Unfortunately, they had run out of the sauce, so I switched it to Maltaise Sauce – an orange and Hollandaise blend. I really liked the chicken – the portion was good and it was from a cut that I enjoy, but what takes the cake is the Maltaise sauce. It’s delicious! However, there was barely a *spoonful* of the lovely sauce on my dish, so I think they were running low on it as well. It would have been perfect if I had more sauce to go with the chicken. 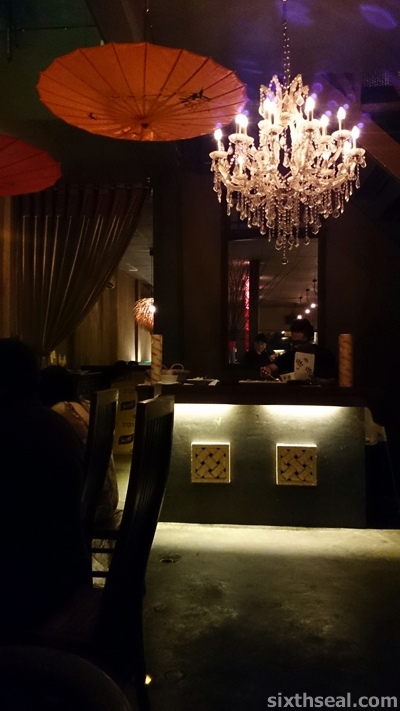 It was a nice dinner though, loved the chill ambiance at the back instead of the noisy booths in front. This is where we went for our kampua fix before flying back to KL. 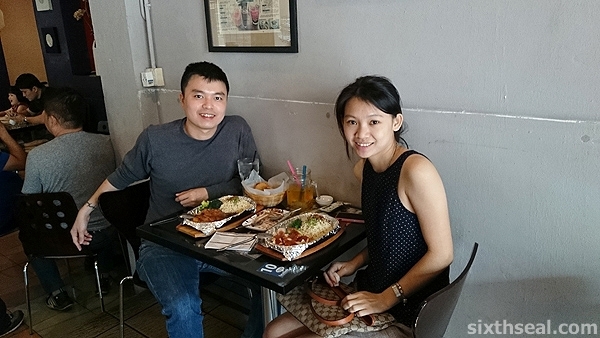 I had the Sizzling Honey Chicken Wings Kampua (RM 13.50) while my dear went for the Sizzling Spicy Seafood Kampua (RM 13.50). I wanted to try the new Sizzling Beef Rendang Kampua though but my better half doesn’t eat beef so I went chicken instead. 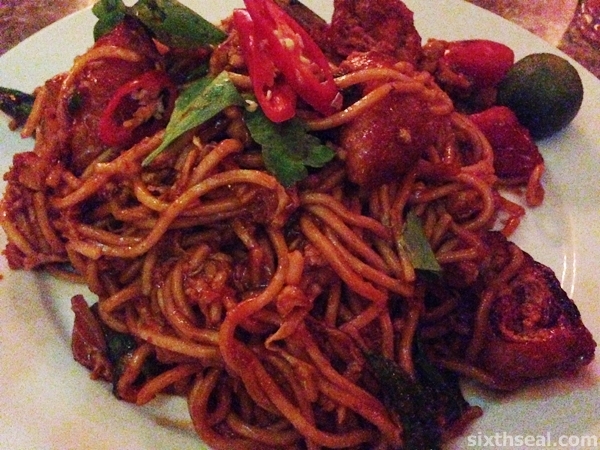 Noodle House has good Sibu local fare in a cafe format and I like the concept. 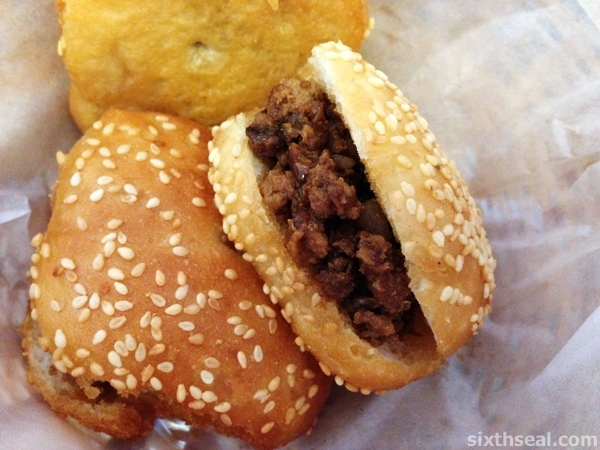 We also ordered some kompia stuffed with pork meat. 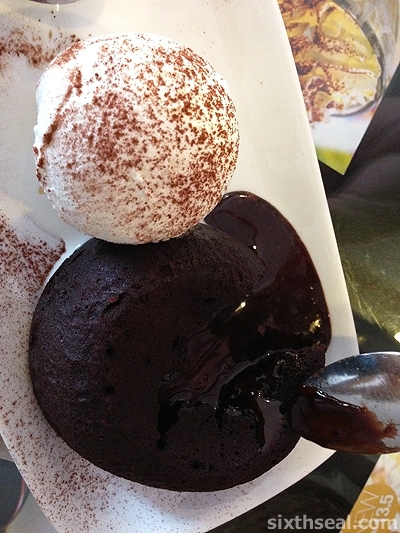 My dear wanted to try their Crème Brulee but I convinced her to go for the Molten Lava Chocolate Cake instead. 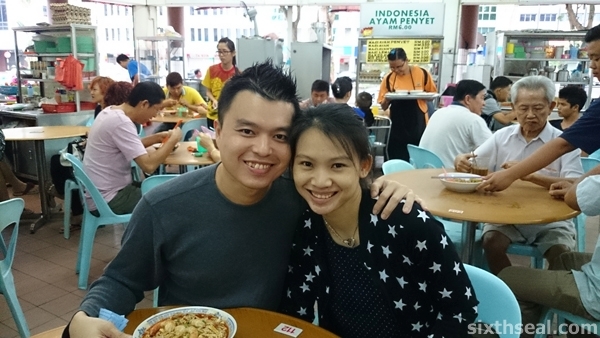 It’s absolutely fabulous – easily the best dessert I’ve eaten in Sibu. 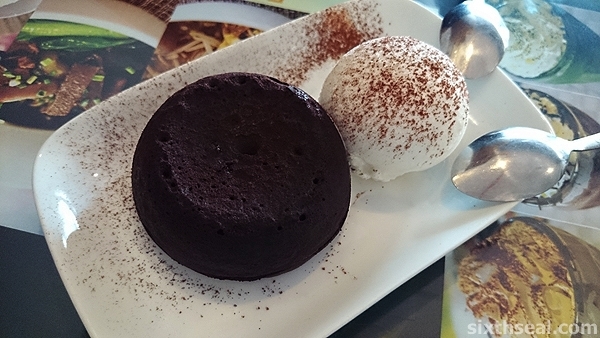 The hot molten chocolate oozes out from the mud cake when you break it open with a spoon. There’s also a scoop of ice cream and a dusting of cocoa powder to top things off. Lovely stuff. 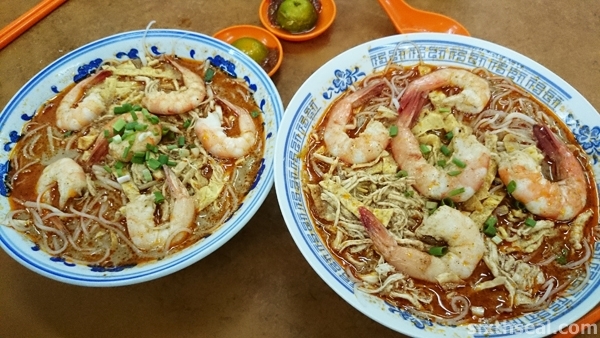 …and I don’t even like Sarawak Laksa that much until I had this then. Haven’t had any in a couple of years! It’s delicious, very prawn-y broth. Was Peter with Country Cafe? Didn’t know that – I only know one guy whose ex-wife runs The Junk in Kuching and he himself had another place, Ken or something in the Sibu bus terminal area…and a club/pub, R & R. Hey! We were there together once. We were just 17 then, hanging out at Country Cafe so that was when he wanted to open his own cafe, he talked a lot about it back then and really did open one, which was Cafe Cafe. Oh yeah, I remember that indeed! I always thought we went to Sarikei before too but it turns out it was Bintangor. However, the back is very quiet, they separate according to that. However, the back is too dark to take photos so it’s a trade-off. For Valentine’s however, I’ll always choose the quiet back! Dude…aiyah., did not get a chance to meet up….ended our three week visit to Kuching. Alas! Yeah, I’ve been trying to email you at hotmal (no i)! Ohshit..hotmal is actually wrong on purpose for identify purposes…anyway. Next time…or when ever you visit. Drop by while I am still in L.A. I may move to live on the wife. It’s the photo with the tray still on. The ones on our table are RM 7 and RM 10 respectively. Yeah, I like Golden Arch in Kuching, reviewed it on my blog before, but they don’t peel the prawns for you. Haha! It’ll be nice to make your own! I’ll love to do that someday. However, if you’re going to Kuching I recommend Golden Arch. They make the stock with crushed prawn heads too (which is why it’s missing from the bowls) so it’s very tasty and flavorful! Haha! Thanks mate, yeah, I reckon that’s the best Sarawak Laksa in Sibu. Kuching has it’s own better spots though. Noodle House is a great place to go too if you want to try all of Sibu’s authentic dishes in a “fusion” style and in air-conditioned comfort. It’s very popular with the locals too! i had belacan fried rice in Cafe Cafe, mediocre only lo.. I personally never order a la carte Chinese/local food from the Cafe Cafe menu except for Mee Mamak. They do “Western” food better, it’s what I order when I go there. I have tried their fried rice (some one else ordered it) and didn’t think much of it too. Remember, don’t order from the Local Favorites menu as a general rule or thumb, go for Western, it’s what they do better! Kompia with pork? Never heard of this before. How does it taste? However, some places also deep fry it (very delicious!) or bake it with pork inside. 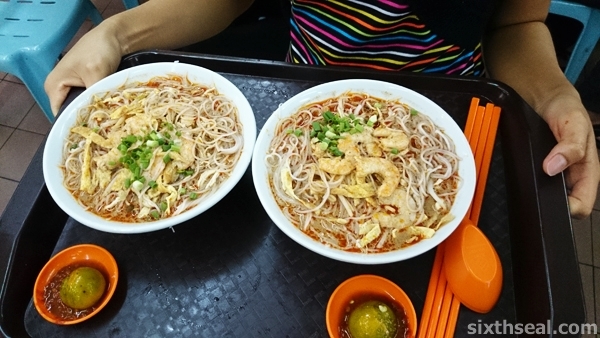 Ooh … the sarawak laksa looks real good. The price looks reasonable as there are prawns and the serving looks big. Funny coz I never really liked Sarawak Laksa (prefer Asam Laksa). However, this time I had it after a couple of years and it was great! Kuching also has a lot of great laksa places. However, over in Sarawak we just call it “laksa”, not “Sarawak Laksa”. Haha! It’s a funny joke someone told me. Pingback: Just last week… | ...Still crazy after all these years!